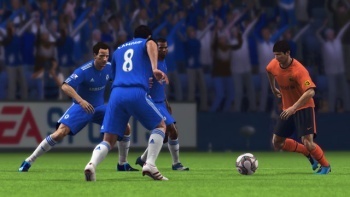 An Italian man was stabbed in the throat by his 16-year-old son after the pair argued about the teenager's performance in FIFA 09. The incident occurred after the 46-year-old man, identified only as "Fabrizio R.," offered advice to his son Mario about how to improve his performance in the EA Sports soccer game FIFA 2009, which he'd been given as a birthday gift a few days earlier. The boy didn't react well to the criticism, however, leading his father to turn off the television. In response, the teenager went straight to DEFCON 1, grabbed a 15-inch knife from the kitchen and stabbed his dad in the neck with it. He then took the knife back into the kitchen, where he washed it in front of his mother, "Monica B.," and left it to dry. Cleaning up huge, blood-soaked knives must be a more common occurrence in Italian households than it is here in Canada, because his mother claimed she had no idea that anything was amiss until Fabrizio "stumbled into the room, clutching his throat." "I saw Mario come back into the room, he seemed calm, he went to the sink and I noticed him washing a knife," she told the Italian newspaper Il Corriere della Sera. "Then my husband came into the room with a hand round his neck, dripping blood." The husband survived the attack and is recovering in hospital, while the boy went to his room after the attack and was later arrested without incident. "Mario is obsessed," his mother said. "He's forever playing on his PlayStation, and we bought him FIFA 2009 because we didn't want him playing violent games." Oh, the irony. You could cut it, as they say, with a knife.